Just list whats in your deck in this discussion @DoctorFro. Sigarda, Host of Herons- My original commander. I got back into magic around time the original Innistrad block came out. I originally started playing waaay back when Ice Age came out and played till like Apocalypse. I've always played Green/white, so I just took my favorite G/W legend as she won many games in standard for me, and made her the boss of my first deck. The deck basically started out as a greatest hits list of magic for me. Mostly knights and angels. Was my sole commander deck for a long time as I didn't get to play it enough to warrent making more. Over time as I got to use it more I tuned it a bit, as it wins a fair amount. It s a solid all around deck that takes whatever people throw at it and keeps going. It's extremely effective at decks loaded with Sac effects...like naah I don't need do that as Meren of Clan Nel Toth decks were everywhere for awhile. 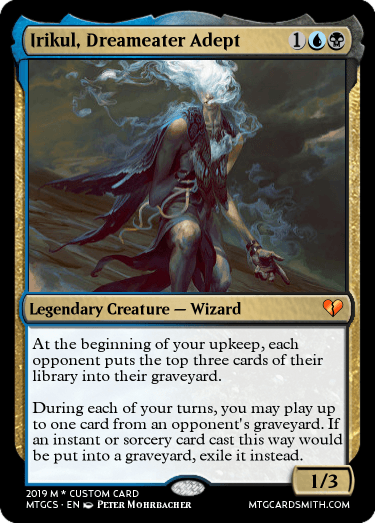 Kalemne, Disciple of Iroas- was my second commander deck. I decided I wanted do boros, and I had geared toward giants, soldiers and a few angels. Many boros players ran Gisela, Blade of Goldnight or Aurelia, the Warleader in the area, so I wanted something different. With the Commander 2015 decks out around time, I picked up a Kalemne. People often dismissed her at first, as she seemed less powerful than the other commanders that year, but people soon began taking her seriously after I smashed them in record speed with her commander damage. I can go thru them that way, or run them down with a large army of stuff. I had alot of tricks make my stuff indestructible so I can hang in there. I know these are "Bad" EDH colors but I just make sure what I cast has maxium impact and value. I don't need to draw a billion cards for answers when my commander ends games. Rafiq of the Many- This probably my most dangerous deck, as I clear the table in short order. It's tons of auras, enchantress effects and cool creatures to voltron up if the boss isn't around to it himself. I have some basic package of counters and removal to make sure I can still solve issues that arrise if the basic gameplan of Commander damaging the table doesn't work out. Trostani, Selesnya's Voice- I made a couple attempts at making a token commander deck in various colors starting with Daxos returned and few others. I eventually made a Trostani deck, I originally tried keep from repeating color identity of commanders, but I said screw it and made what I really wanted. I weaponized lifegain as I have Aetherflux Reservoir, as this card ends games so effortlessly. I just mash down tokens and...boom you're gone. Oh you're gone too. Otherwise I can just run people over with my token army. Ezuri, Claw of Progress- I decided make an elf deck going blue and green for a bit more reach. While I sometimes win via cheese my commander and sage of hours(5 counters a turn means infinite turns. ), I more often than not make massive critters and roadkill the board. It has so many tricks with +1/+1 counters it gets be tough keep track of all triggers and math. Lots of elves, hydras and other good stuff. Queen Marchesa- This a fun aggro deck.The monarch on demand (Always toss cards that give you it in your decks if you can fit them. )in the command zone helps the card draw. It has alot of life gain, anthem effects, and ways bring stuff back from the graveyard. I considered changing to a Saskia the Unyielding, but I got tired of the 4 color commanders eating my dual lands. Atraxa, Praetors' Voice- Lots of stuff with counters, as I stuff maximize her ability, but her greatest issue is she is too good of a beat stick, as all cool things she can do with proliferate, she just ends up beating someone down since there's almost never a good reason not to attack. She has flying, lifelink, vigilance and death touch. Like someone attached a swiss army knife to a rocket launcher. I wish they made her more about proliferate and less awesome as a beater. I have a love/hate relationship with this deck, as I love the cool stuff it does, but I find myself just whomping people with her and making the rest a moot point. Breya, Etherium Shaper- I probably don't have the most tuned Breya deck. I sometimes get so caught up in doing stuff and valuing the crap out my cards that I kinda forget to you know...actually win heh. Like look at all the Thopters I have muhahahaha!...oh wait I really should be casting Purphoros and kill you already. I have fun but I have a spotty win record with it. Kynaios and Tiro of Meletis- I decided I needed make a deck waaay different than rest of my stuff. More often, than not I am turning creatures sideways and ending people. And I like it that way. I felt like I needed still bring something else to my playgrounds as I made a grouphuggie deck designed run people out of cards with some mill effects. I can kill people to other means such as black vise type effects, but making people draw all their cards is the main thing. It's definitely a better group deck, but I am far from useless if I fight one on one. Edgar Markov- I am sure mine is similar enough to other peoples, but I did make I had some knight synergies as well since they effect the commander. Everyone was playing it for awhile, so stopped bringing mine for a bit. Arahbo, Roar of the World- Again this deck has majority of the cats you'd want already in it. I added the other cool ones like Brimaz and my promo adored pouncer. It's very explosive as a single cat can do sooo much damage. Bruna, the Fading Light- I again decided to go against my usual path. I am sure in some other reality I made a deck with Gisela, Broken Blade as my commander instead, and focused on beating face with her. This a more controlling oppressive in nature deck, as I don't normally go that route. I also put all new eldrazi titans in it, as I made this deck Angels and Eldrazi. I generally don't like Eldrazi but felt they were on theme, and made this one deck I allowed them to occupy. Narset, Enlightened Master- This a deck I don't play a ton as people just groan, but I figure got have a few hated decks. Mine is fairly tame comparison what it could do, as I just try value you to death by simply crapping out tons of planeswalkers, auras, and enchantments. I don't play a ton of extra turn cards. Sometimes it does gross things, others the Narset lottery does not pay off as I wiff with lands. Kaalia The Vast, this a recent deck. I don't play mass land destruction effects it in. I probably actually lose because of it, but I accept that. If I can't run you down quick enough, then that's my fault. As for EDH cards..This some I'd recommend I don't think see enough play. Always Watching-http://gatherer.wizards.com/Pages/Card/Details.aspx?multiverseid=456527 One of the best anthem effects. I loved the heck out of it when it was in standard, it still performs great in commander, where you have multiple opponents and can still keep yourself from being mauled back. Celestial Dawn- http://gatherer.wizards.com/Pages/Card/Details.aspx?multiverseid=106639 Another way of getting your colors in a multicolor deck. Much cheaper than a chromatic lantern moneywise(you can always play both)...though they should come down thanks to being reprinted. It does have the drawback of being more vunerable to white hosers, but in 3 and 4 color decks I find makes everything easy to cast. Many people forget or don't know this card exists. Righteous War- http://gatherer.wizards.com/Pages/Card/Details.aspx?multiverseid=3741 This shuts down the two major removal colors , which I play in my mardu decks. (which Queen Marchesa gets both protections.) With the Knight Tribal decks some of you are bound be playing, you might want another way protect your knights for those who don't already have protection built in. It's thematically on point that's for sure. Titania's Song- http://gatherer.wizards.com/Pages/Card/Details.aspx?multiverseid=4015 People play waaay too many artifacts. Punish them with this. This will surprise alot of younger players when you hate them out with it. Purify-http://gatherer.wizards.com/Pages/Card/Details.aspx?multiverseid=12367 People play too many enchantments too, so blow all that crap up. Planar Collapse-http://gatherer.wizards.com/Pages/Card/Details.aspx?multiverseid=12365 Need a cheap wrath for those early game players who drop their hand by turn 3...this might get em. It's an enchantment, so it's searchable in white. Essence Filter- http://gatherer.wizards.com/Pages/Card/Details.aspx?multiverseid=184718 Wanna wreck all the enchantments on the board but your white ones? This does that. You can still nail everything if you need to. Anyone want to build around this commander? @Temurzoa i love the art on that card! @Ranshi922, Samarethiel is commonly used for Ashiok planeswalkers. Also, note that the ability says 'play,' so you can play lands from your opponent's graveyard. So I have been busy today going through some cards I have in storage at the storage unit I have kept in stock. My friend @Dechujoh64 just yesterday lost his edh commander deck Arahbo, Roar of the World (with major additions added to the deck then the orginal precon, mind you, so it actually was worth more than the original precon build when he first purchased it). He came back to get his deck as he felt he left it at the eatery we all go to by accident, and the deck was not where he left it, so we all believe it was stolen. Needless to say, that deck was his baby, and he's been depressed over it being gone. So @MurkKnight5 and I are going through our own stuff to try to get him somewhat back in the game, I already had made him a golgari deck with a temporary commander (Slimefoot? It came out in Dominaria set, but the deck is more gorgon and counter based then saproling/fungus based atm.) before this happened, as he sold all his decks BUT the Arahbo deck, and that was because he was pressed for money, and then the Arahbo went missing? Slimefoot is all he has for now. Again, I am hoping to get some more cards for his remake of the Arahbo deck. I imagine it will take quite some time to make this version as good or better then the missing deck, but I am hoping this is like Karma and if I ever need the help that people will give me the same kindness in return, but of course it's not expected. I just hope this will make him feel a little better. I had to help Aryanf out in the same way when her Selenia, Dark Angel deck went missing. That was her baby too. The new version she really likes and it's almost complete, its just missing a few cards from the original version. She plays it all the time. I gave her my old legion "ninja" deck box to store it in. Anyways so I dug out one of my decks I haven't played in awhile and @Ranshi922 had asked me some time ago what I had in my "Ocean" deck as he and his brother was constructing one and he wanted ideas, so here is the deck, and of course, if YOU got any ideas for the deck, by all means, drop the ideas here I will look over and consider each one! Here it is, I'm too lazy to organize this so I'm listing as I see the cards come up. I'll share more decks I own with you guys in the future, but this is a start. @Ranshi922, what's in your Slinn Voda, the Rising Deep deck? I am currently working on a somewhat unique EDH deck on Bruna, The Fading Light. @DoctorFro it was at a very large public place we frequent a lot, we all call it the eatery (well thats because it IS a eatery) this isn't the 1st time this has happened. @TemurGideon lost one there before as well. @DoctorFro I made a charm for you a few days ago I didn't know if you saw it or not, when you get a chance check it out, let me know if you want it different or if you like it, etc. etc. @sanjaya666 no prob. Did you like it? Oh no @sanjaya666 i meant did you like it like it? I know rhystic study @DoctorFro, whats jund rhystic studies then? @sorinjace It's cool boss. Really appreciate the effort. Technically, I've never played a single match IRL though, or owning any real cards anyway. So, all in all, I... actually have no idea lol. I've got a pretty fun General Tazri superfriends deck. It's half allies/half superfriends so you can swap to a fast paced creature deck or a slower paced superfriends deck depending on whats happening. That being said, I can't wait for War of the Spark cause some of the cards are going to be killer for superfriends and I'm ready for it.